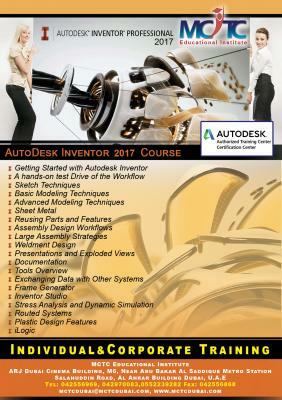 Make an excellent foundation to familiarize features and commands of Autodesk Inventor from MCTC Dubai. Call today and register with us to start a new path of learning journey! We are Autodesk authorized and certified training center that provides professional training for several Autodesk and engineering courses in UAE since 2006. Our Inventor course is a job-oriented training program for students as well as working professionals who look to enrich their career and excel in the profession. Learn Inventor, an efficient software for mechanical design and simulation from the experts in Dubai!